Founded in 2005, VMFP is dedicated to ensuring that the rights and needs of veterans, active-duty service members (including national guard and reservists), and their families are understood by the American public, endorsed by our elected officials, and protected by legislation, regulation, and public policy initiatives. Senator Warner has demonstrated an extraordinarily strong commitment and deep understanding of the issues that affect America’s veterans. For the past six years Senator Warner has been a strong supporter of our nation’s veterans and active armed forces. Mark Warner understands the need for military members who are reintegrating into the civilian job market to have access to educational benefits and job training opportunities and has supported legislation that helps to achieve these goals. His public support for priority funding of the Veterans Administration and his declared determination to provide for the establishment of a national veterans and military family policy give veterans and their families hope that at long last a Senator will vote in such a way as to keep faith with those who have served and sacrificed. 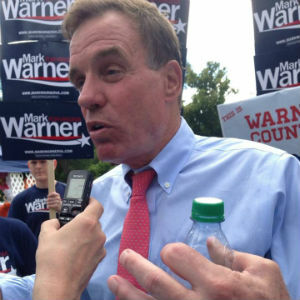 Senator Warner’s father is a WWII Marine Corps. veteran who fought in the Pacific and so he has a deep and personal understanding of the issues veterans and their families confront. Thus his decision to support legislation for improving the treatment of veterans with traumatic brain injuries and PTSD, and his deep understanding of the need for providing and guaranteeing full health coverage for National Guard and Reserve personnel, demonstrate that he is a candidate who has the character and courage and personal family experience to do what is right for those in service to our country. We feel that veterans, active duty, military families, and in fact, all people of Virginia will be well-served with Senator Warner’s reelection by ensuring that America remains strong in national defense and in fighting terrorism.